Information about the weather is more accessible today than it ever has been. There are countless apps, websites and TV programs that aim to tell you what kind of weather to expect in your general area. This sometimes isn’t good enough, though. Measurements are often taken around airports, for example, which can be pretty far away from your home. This is why so many people are turning to home weather stations. These units are geared towards those who are just interested in more precise information, professionals who need exact data to know how to tend to their plants or conduct research, and so on. 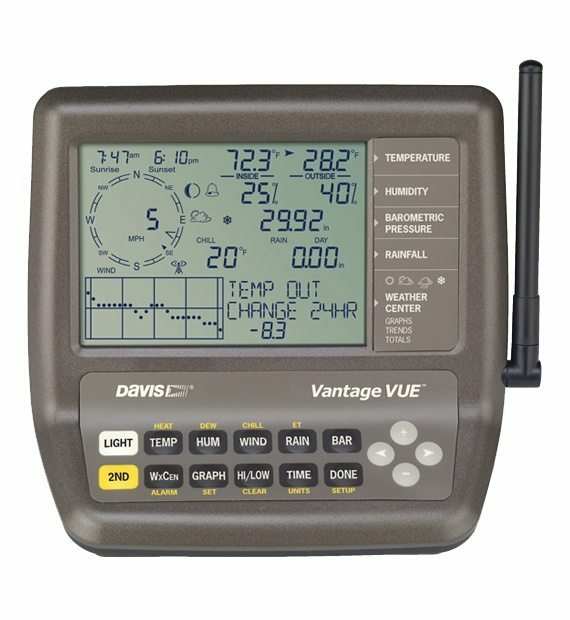 If you’re interested in a personal weather station, one of your options is the 6250 Vantage Vue. This instrument is produced by the Californian manufacturer Davis Instruments, a leading name in this area. The Vantage Vue is on the more basic end of the weather station spectrum. However, it still measures an impressive array of data, including temperature, humidity, pressure, rainfall, and wind. It offers several other cool features, which makes it well-suited to catch the attention of any potential users. 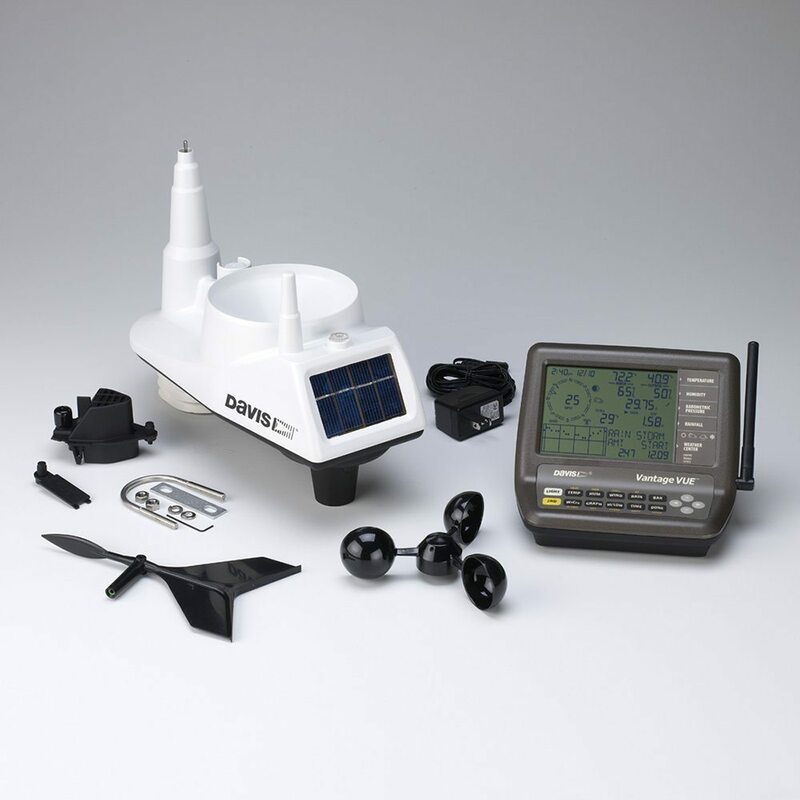 This weather station is the solution Davis Instruments offers to beginners, with the more advanced Vantage Pro 2 being their flagship product. This makes sense, as the Vantage Vue offers plenty of functionality but none of it really specific to any area of expertise. If you are a layperson interested in getting a more accurate account of your local weather, this product is made with you in mind. Should you want measurements of, say, soil moisture or solar radiation, you should look into other products that are more suited to those needs. In the Vantage Vue box, you will get the essentials you need to set it up and start using it. What you shouldn’t expect is any kind of mounting pole or tripod. You can buy these separately from Davis Instruments or elsewhere, or you can probably also build a makeshift holder yourself, as the instrument is pretty small. If there’s one thing that sets the Vantage Vue apart from similar products, it’s how easy it is to use. Everything from setting up to interacting with it is intuitive. People with no experience whatsoever in measuring weather would find the kit approachable. The integrated sensor suite is the powerhouse of the Vantage Vue. It’s easy to understand why when you see the number of functionalities stuffed into such a small casing. The suite is made to withstand extreme weather conditions. At the same time, it’s specifically designed to be sleek and inconspicuous, so as to not stand out from its surroundings. Its anemometer can record wind speeds from 2 to 150 mph. This is within the range of the winds most of us have to deal with. If you’re living in a hurricane area, however, an amateur weather station just isn’t going to cut it. The temperature sensor can measure anything between -40°F and 150°F – there are few places in the civilized world that exceed these limits. The kit measures both outdoor and indoor temperatures. The rain collector measures rainfall in 0.01-inch increments. It’s self-emptying but has no way of keeping birds away. They can easily gather there to drink the water, so you will probably have to clean their droppings once in a while. The Vantage Vue runs on solar power. During the day, it gathers enough energy to run through the night. A backup lithium battery is on standby when needed, so you shouldn’t have problems in this department. Another selling point is the wireless transmission of data from the sensor suite to the console. And there’s a lot of data since the readings are updated every 2.5 seconds. As long as the distance to the console is 1,000 feet or less, you won’t need to run any cables across your yard. The console itself is not complicated to read, which is a feat when you think about all the information it provides. It, of course, shows all the data from the sensor, but also offers analyses and graphs based on the weather over the previous 25 days. You can navigate through all of these using the glow-in-the-dark keypad buttons. Particularly interesting are the This Time Yesterday and Change in Weather Since Yesterday features which allow you to compare day-to-day weather trends based on multiple variables. Even more useful is the forecast function which predicts the kind of conditions to expect. You want to be warned if the weather gets too extreme, so the console offers alarms. You can set up to 22 different alarms warning you of floods, strong winds, freezing temperatures, etc. As measurements reach the main console, there’s also the option of it retransmitting the data. This is a good feature for those who want to have a display with information both downstairs and upstairs in their home, for example. You also have the option to buy a WeatherLink data logger from Davis Instruments. This way, you can transfer the data to your computer for further analysis or upload them online to your personal weather page. This way, you can see readings from your weather station even when you’re away on a trip. As mentioned, the ease of use is probably the main selling point of the Vantage Vue. You can have it up and running in less than half an hour. Here is a handy installation guide that takes you through all the steps. The Vantage Vue has all the bases covered when it comes to the needs of most average users. If you want a feature that this device doesn’t offer, you probably need a solution geared towards more advanced enthusiasts. In this case, you don’t need to look any further than the Vantage Vue’s older brother – the Vantage Pro 2. It offers the same basic features but with the possibility of more specialized uses. It can also power through more extreme conditions, meaning that it would work for most users. 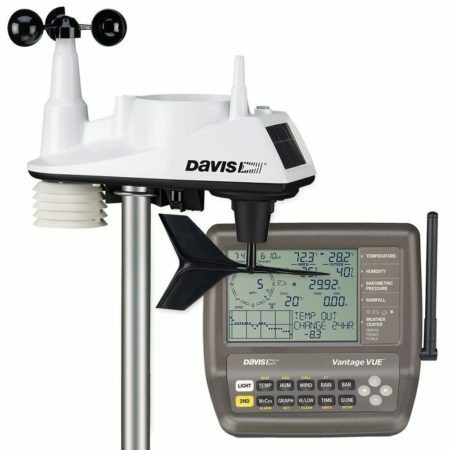 Offering numerous features that would satisfy even some of the more demanding users, the Davis Instruments 6250 Vantage Vue is a weather station that is bound to keep you informed without feeling overwhelmed. Keep in mind, however, that beginners are its primary target audience, so seasoned weather buffs should look into other, more specialized options.